Today is the Reveal for November and December's selection for the Inspired by Reading Book Club! Due to the holidays, we had to adjust the schedule a bit. For November, we read, "Bridge of Birds" by Barry Hughart. 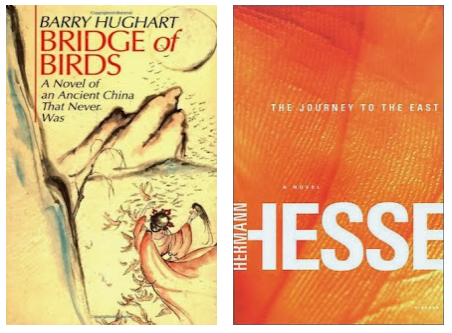 For December, we read, "The Journey to the East" by Hermann Hesse. It's interesting how both books, were quest books. "Bridge of Birds" was a novel written in the style of ancient Chinese folktales that follows the paths of Li Kao and Number Ten Ox. They have set out to find the Great Root of Power to save the village children from a sudden illness. The book is told with tongue-in-cheek humor and moves at a quick pace once the journey begins. In "The Journey to the East", the narrator belongs to a mysterious League who voyages to the East. Each of the characters on the journey all have a different goal in mind. The narrator seeks to find Princess Fatima, but the quest is vehicle for more psychological and philosophical questions. The relatively short novel is told in a confessional style that is a recollection with details obscured by secrecy and self-described poverty and illness. The first book was met with overall favorable reviews, while the second was met with mixed results. Both had some interesting imagery to pull from. Unfortunately, due to the inclement weather our in-store meet-up was canceled. It's a shame, because I really do look forward to these gatherings. I think that everyone who comes uses it as an opportunity to do more than just talk about books and being crafty, but to unwind and socialize. This necklace was made by Laurel for "The Journey to the East". This necklace features an Asian-inspired gunmetal toggle clasp, spindle-shaped carved blackstone, and white calcite. The necklace refers to the circular nature of the story and the contrasting tones exemplifies the dark and light aspects of the human heart. This necklace was a recent find at Kilbride Antiques by Laurel that she wanted to share. She thought it was particularly apt for "Bridge of Birds". The necklace is made of vintage black clay, Mexican Oaxaca fetish beads in the shape of birds. 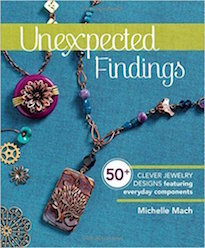 "Based on the text that the pieces are sitting on, this is my necklace with matching earrings. Obviously the focal pieces are: star (from Allegory Gallery), cloud (Etsy), sloth (Mark Poulin -Etsy *very cool stuff, worth checking out), lotus flower (Etsy), feather (freebie from Etsy seller with purchase(, broken tree pendant (from really bad Etsy seller..), Green chain was sourced from a broken necklace. Woot woot! Bird/heart/red stone and brass dangle pieces represent the garden in the text. They are sourced from the Destash page. The blue/khaki glass is Czech glass from Allegory Gallery. 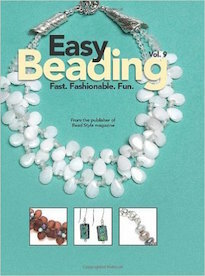 The beaded strand is various shades of jade and turquoise. I basically tried to not go crazy with ginseng or gemstones. Wanted to stick with the passage imagery." Here's a close-up of the earrings that were made by Laurel for "Bridge of Birds". Here is a close-up of Laurel's necklace. "This asymmetrical sterling silver, blue topaz and pearl necklace with a bit of wirework is what I was inspired to create. I see a beautiful, but circuitous journey. It is the first time I have created something that was not inspired by the materials I am choosing to work with or something visual, like a flower in the garden etc. Therefore, I imagine that there is still a lot that thrown in. Old habits are hard to break!" This necklace was made by me for "Bridge of Birds". This necklace is composed of silkworm cocoons, pearls, jade barrels, and a sterling silver bird toggle from my family at Green Girl Studios. In the book, silk production is a highly valuable source of income and is part of the catalyst for the events of this book to take place. I have had these silkworm cocoons for awhile and never knew what to do with them. I decided to use them in this necklace. They're extremely lightweight and rattle. (Apparently the silkworm is still inside!) The jade and pearls were selected because they reappear often in the book… even one of the characters is named that! The necklace seems simple, but don't let if fool you! It was tricky punching holes and then threading the flexible beading wire through the cocoons! This bracelet was made by me for "The Journey to the East". The book references the journey taking place around astronomical and astrological movements and observes several magical practices of different traditions. I used wooden beads from Lillypilly that are laser-engraved with alchemical symbols to depict that. The wooden beads are spaced out with Czech glass from Allegory Gallery. They also mention that several of the League are in Africa and is why I used the brass dowry ring in the center to hang charms off of. I have included a rutillated quartz star, a hand harm, and a key. The hand is sometimes called a "Hamsa". It is also known as the "Hand of Fatima". The narrator's quest is to find Fatima, and I thought it was an appropriate translation of his desires. The key symbolizes unlocking of the mind and spirit. Also, one of the other members of the journey is in search of Solomon's Key, which will enable him to learn the language of birds. The bronze toggle is also from my family at Green Girl Studios. 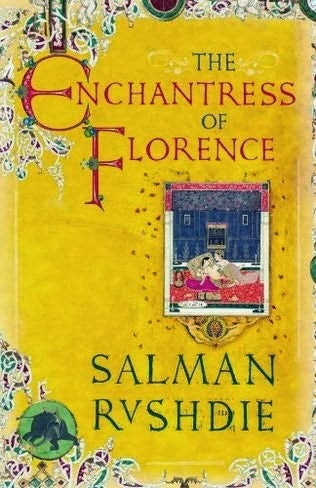 The next book is, "The Enchantress of Florence" by Salman Rushdie. For the remainder of this year's list, CLICK HERE. The new list and schedule will be announced shortly! The in-person meet-up at Allegory Gallery is scheduled for Tuesday, February 4th from 6PM to 9PM. The next blog hop is scheduled for Wednesday, February 5th! If you're interested in keeping up with what we're doing, CLICK HERE to visit our Facebook page. CLICK HERE to view our Pinterest board with supplemental inspiration. The pieces that you created are really lovely! I love that you've created challenges within this challenge, by using destash items in your creations. It is so nice to see things take on a new life and be transformed into things of beauty! The Journey to the East necklace is really elegant and very wearable. I like that the clasp can be worn in the front or the back or off to the side. It has a lot of versatility and looks very posh! The Bridge of Birds pieces are awesome! I love how eclectic and collected the necklace looks. I bet it has great movement and is fun to wear! And thank you for sharing the vintage bird necklace! 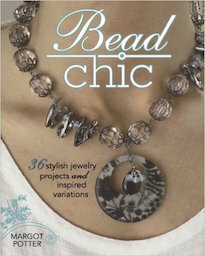 I have a small stash of these beads and love them! Thank you so much for participating and for being such a strong supporter of the group! I appreciate our friendship that has grown stronger because of the book club! You rock! Karen: Welcome to the group! I appreciate you reaching out to us and participating in this challenge! 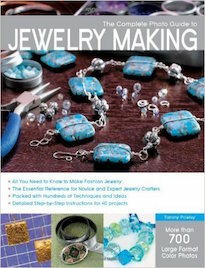 (Thank you Beadwork magazine for connecting us!) The piece you created is really stunning. I love how the chain mixes with the stones and has a really opulent and contemporary feel. You've done a wonderful job and I can't wait to see what you make in the future! Thanks you guys for participating! It warms my heart! I am always amazed at the diversity in the participants creations. We all read the sam book, but each of us sees something different to stimulate their creativity. Laurel's Journey to the East necklace has such an oriental feel to it and I really like the clasp she used. In her Bridge of Birds necklace I like how she found a charm to represent the elements in the text she was inspired by. In Karen's piece, I like how it represents a circuitous journey and she how she was inspired by the book instead of by the materials. I like your use of silkworm cocoons in the first bracelet. 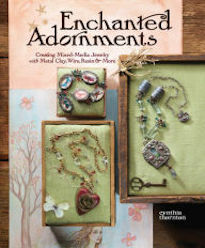 I have used them in my fiber art work, but never thought to incorporate them in my jewelry. Very creative. In your second bracelet I like how every element relates to something in the book. I think it is very wearable. The participants have made some very inspirational pieces and it's always nice to see how a piece of literature can affect someone's creativity. I love your bracelet, it's incredible. I always get sensory overload with all the great things everyone creates and it's always amazing to me the different directions we all take. Laurel, I do love that clasp on your first piece and how you pulled all the little detailed elements into your Bridge of Birds set. Karen, I echo everyone else's words of welcome. It's great to have new folks join in the fun. Your necklace is so elegant. Andrew, as always, thanks for being our fearless leader and the glue that keeps us together! This is my favorite monthly challenge for many reasons and you are one of them. I can't believe you made a necklace with silk worm cocoons! That's so strange and wonderful to me. It looks so light that it could blow away. Your bracelet is very cool too...probably more my style as far as what I would wear. I like how you tied so much symbolism into your creation. I can't wait for next month... except I'd better start reading! There’s so much creativity in this group. It is inspiring to see the distinct point of view of each participant. Laurel, I love the use of contrasting tones in your necklace for The Journey to the East. You did a great job with the two strands! That bird necklace was such a great find. Thanks for sharing. I really enjoy the pieces for Bridge of Birds. You represented the passage well! Thank you telling where the parts came from – Don’t you love finding hidden treasures in you stash?! Welcome to Karen! I know what you mean about old habits! That’s what I love about this group. It challenges me to stretch my imagination and my skills. I was so focused on getting through the book that I didn’t originally catch that it really was a circuitous journey as you and Laurel both did. Andrew ~ where ever did you find silkworm cocoons?! Another one of those amazing finds that sit around waiting for just the right moment. Perfect for the book! How big are the cocoons? Looks like an amazing summer necklace. As for the bracelet, I see that you and I both thought about the “Hand of Fatima”. All I could find while on vacation in Key West was a 3 foot hand. Sadly, Key West no longer has a true bead store. 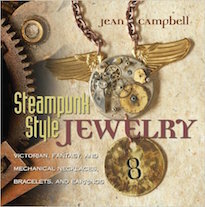 Love the combination of literature, creativity, and jewelry. Fun post. Andrew you always host this group so well. 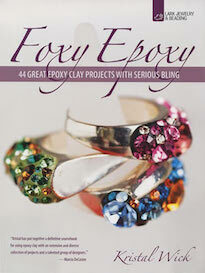 Wonderful write ups about the book and all of our pieces. Thanks so much. 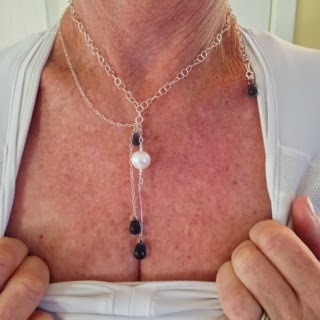 Laurel I love the simplicity and eastern feel to your black stone and white necklace!! I especially like your charm necklace inspired by The Bridge of Birds. Each charm is so unique and carefully chosen to reflect a part of the journey. It is also very much in the tradition of charm bracelets/necklaces from China which I am so enamored of. I still have one that I was given as a child. Laurel I also like the way you place your creations on the text that inspired them. What a great idea!! Welcome to the group Karen Hiatt!! It is great that you are joining in. Your beautiful necklace appeals to me because it is so free flowing and your asymmetry works perfectly. Love the silver and blue together. Lovely interpretation of the journey. Look forward to seeing you back next month. Andrew, those cocoons are to die for. What a brilliant idea for the Bridge of Birds book. Just perfect. So interesting that they are hard and rattle. Lovely necklace!! Love the large hand of Fatima in your bracelet interpretation of Journey to the East. It is such fun finding or making components that go with the books we read. You found some beauties for this bracelet. Looking forward to next month for another adventure in creating with this wonderful group!! Can't wait to see what everyone makes!! What an amazing and inspiring gallery of interpretive jewelry. It must be fun researching and shopping for all the elements. Andrew, I love how you used the Hand of Fatima. It's beautiful in itself and ties in with the book perfectly. 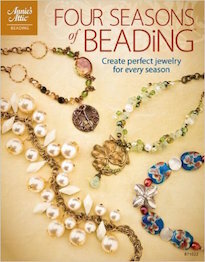 Love this combination of reading, which is one thing I adore, and jewelry designing--another thing I adore! Great.